What do you do when you’ve received invitations to every costume party in Ooo on the same night? Go to all of them, of course! 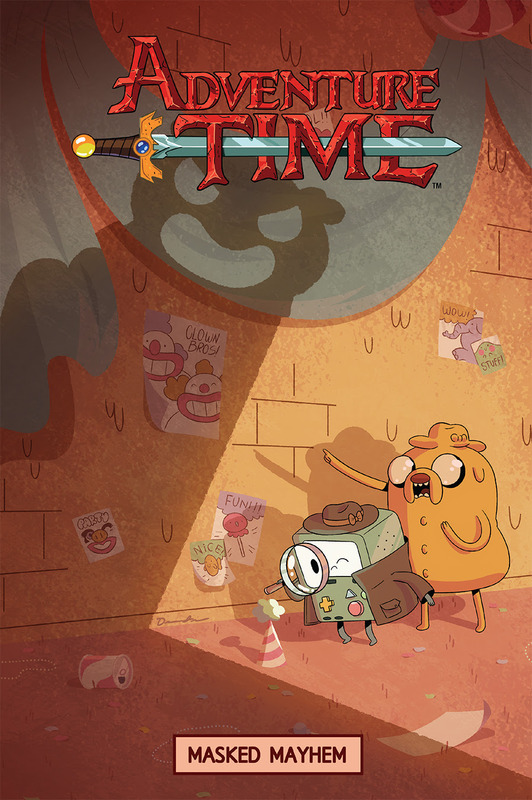 BMO and Jake are dressed up and ready to party-hop in Adventure Time: Masked Mayhem, the sixth Adventure Time original graphic novel from KaBOOM!, the award-winning all-ages imprint of publisher BOOM! Studios, and Cartoon Network Enterprises, the licensing and merchandising arm of the network. Detective BMO and his sidekick, Jake, are on the case when they discover that every party they attend has one thing in common: a prankster! Join them as they travel all across Ooo to catch the culprit while still enjoying some fun times with friends in this 160 page, full-color adventure from writer Kate Leth (Power Up; Patsy Walker, A.K.A. Hellcat) and artists Bridget Underwood (Adventure Time: Graybles Schmaybles), Drew Green (Lotus for Help! ), and Vaughn Pinpin, with a backup story by Meredith McClaren (Heart in a Box, Hinges). The Adventure Time: Masked Mayhem original graphic novel (6” x 9”, 160 pages, full color) arrives in comic shops on November 11th and in bookstores November 17th with a cover by Drew Green for the price of $14.99 under Diamond order code SEP151131 and ISBN 978-1-60886-764-6. The Final Order Cutoff deadline for comic shop retailers is October 19th. Not sure where to find your nearest one? Use comicshoplocator.com or findacomicshop.com to find one! It’s also available for order directly from boom-studios.com. MAN PLUS #1 Now Includes Variant Cover from Ryan Stegman! Check out a sneak peak and trailer for the exciting new series from André Lima Araújo! NYCC 2015: Valiant and CGC Team for VALIANT x CGC REPLICA VARIANT SERIES – A Fun-Filled New Line of Reproduction Covers “Encasing” Your Favorite Heroes in 2016!